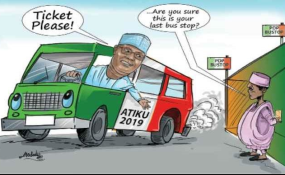 Abuja — The presidential candidate of the Peoples Democratic Party (PDP), Atiku Abubakar has vowed to reclaim his stolen mandatae. This is coming as the Senate President and Director General of the PDP Presidential Campaign Organisation, Dr. Bukola Saraki, has said President Muhammadu Buhari's "purported victory" in the February 23 presidential election would be short-lived. Meanwhile Saraki has said that President Buhari's "purported victory" in the February 23 presidential election would be short-lived. "I think it is a shame to the country and to those that were given that responsibility to do."